I have been watching the Die Hard films since 1988. I remember going to the theater to watch Die Hard with my best friend from high school and we had a great time, thoroughly enjoyed a film that I would go on to watch at LEAST 400 times since! On Thursday morning, Valentine's Day, I received an email from Amazon.com offering the 25th Anniversary blu-ray collection of the previous four Die Hard films for only $25. The offer was valid for one day only and I totally bought it without hesitation. But the bonus deal was that if I purchased the collection that day, I would receive a $10 certificate to watch A Good Day to Die Hard this weekend. Sold! So, not only did I receive my blu-ray collection on Friday, I also got the email certificate to redeem at the theater. My friend Laurie and I went to see 'A Good Day to Die Hard' on Saturday, and I was surprised by how light the traffic was in the entire theater... not your typical Saturday evening, but oh well, it's mid-February, dead movie month. Anyway, I saw the movie and we quite enjoyed it. In A Good Day to Die Hard, we are introduced to the other McClane kid, Jack, who is in Russia working for the CIA on an undercover operation. He has been estranged from John (no surprise) for many years, and John McClane sets off to Russia to find and supposedly save Jack from going on trial for attempted murder. The car chase scenes throughout Moscow were very entertaining and awe inspiring. I reckon half the film's budget went into that scene as well as the finale with the helicopter at Chernobyl. 'Good Day' has a thrilling twin double-crossing plot, and incredible action scenes. It's not the strongest film in the series but it's solid good entertainment. I really enjoyed Jai Courtney as Jack, and I was telling my friend how refreshing it is to see a new face in a high profile co-starring role. 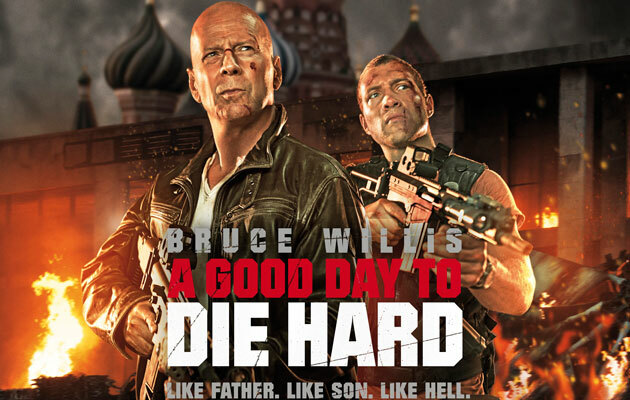 And for a 58 year old actor, Bruce Willis is still at the top of his game, he is a box office draw, and I'm sure he can squeeze out at least one more Die Hard film. And if that happens, it would be cool to see John with both Jack and Lucy helping him 'Kill some bad motherfuckers'! If you want to watch a fun high-action packed film with lots of guns and crazy Russian killers, treat yourself to 'A Good Day to Die Hard', especially if you enjoy all the Die Hard films! All the actors have justified their roles completely. The script was not up to the mark but the action, stunts and the explosions were really 'dhaansoo'. The best were, the car chase sequence (longest I have ever seen) and the ramming of the helicopter into the building by Irina (Yuliya Snigir). There were some humorous portions as well which showed McClane's (Willis's) cool dude style. Overall, the movie was a nice entertainer and the action sequences keep you glued to your seats. London and Paris this Spring! AMPAS is so proud of itself! Oscar Day - No Guts, No Glory! Guest Blogger: To Swear or Not to Swear?